Much has been written already about the latest French 'work-life' balance and the country's commitment to labor laws and protecting workers' rights. However, the latest 'policy' that had Twitter aflutter was the claim that it would now be a violation if an employee checked work emails after 6 PM. 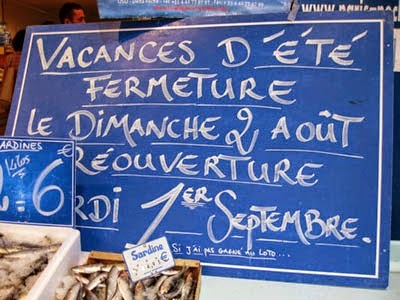 Closed for vacation sign in Paris. Such pro-worker policies are often met with head shakes and disbelief in countries like the US, where articles like this one are the norm. Many Americans get hit with a twinge of jealousy, and can only dream wistfully of a European lifestyle that includes (a required!) 5-8 weeks of vacation a year. The French, on the other hand, seem to have mastered the art of living well and the joie de vivre. 1) This decision was not a law in France. It was actually a decision between two large workers' unions and an employee federation. 2) This does not affect ALL employees in France, but rather, only affects those working over 35 hours per week (i.e. managers). This typically includes consulting companies, and branches of foreign owned companies like Google, PwC, and Deloitte. Either way, living the joie de vivre sounds pretty good to me.